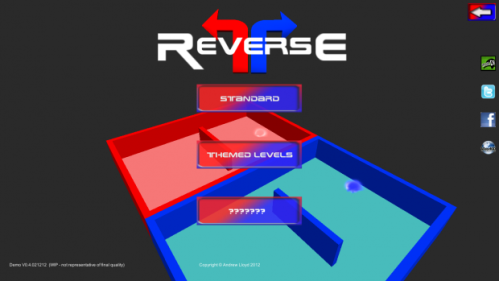 Description ReversE is a point A to point B mirror logic based puzzler. The game spans across a series of increasingly complex and intricate puzzles which aim to test your logical skills, reaction times and spatial awareness. Navigate your way through levels filled with tricks,traps hazards and many other pitfalls in the fastest time possible. An originally composed electronic/ambient soundtrack accompanies the game aiming to provide players with a fun, serene and ever increasingly challenging experience couple with the beat the clock element! A must for lovers of the puzzle genre! ReversE is the brainchild of Andrew Lloyd a UK based indie game developer who is the soul creator and Dev on the project!